Greg McCormick Allen (Mr. Braithwaithe), Mari Nelson (Mrs. Wilkinson), Philipp Mergener (Billy Elliot), Eliana Coe, Priya Niehaus, Lacey Krueger, Charlie Ganz, Eden Vold, and Cordelia Janow (Ballet Girls), and Jasmine Harrick (Debbie Wilkinson). 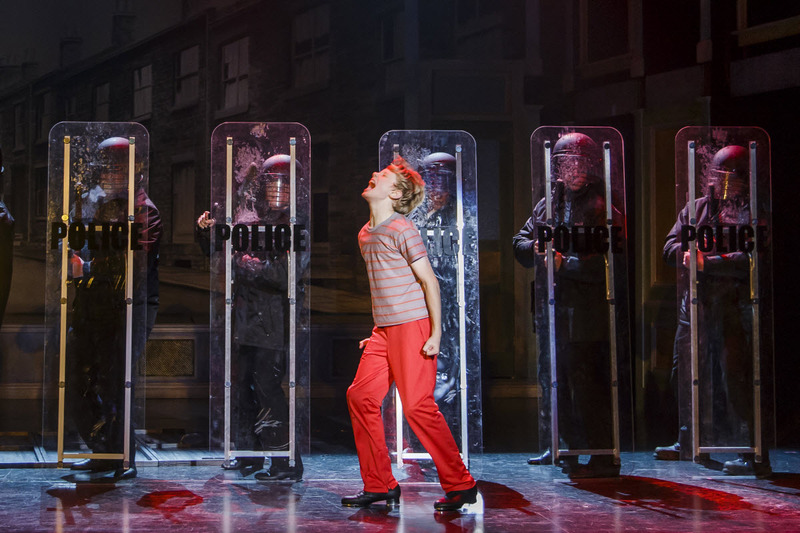 Billy Elliot the Musical Production photo. © 2016 Mark Kitaoka. Often the most successful productions are ones where the backstage reality mirrors the onstage story. 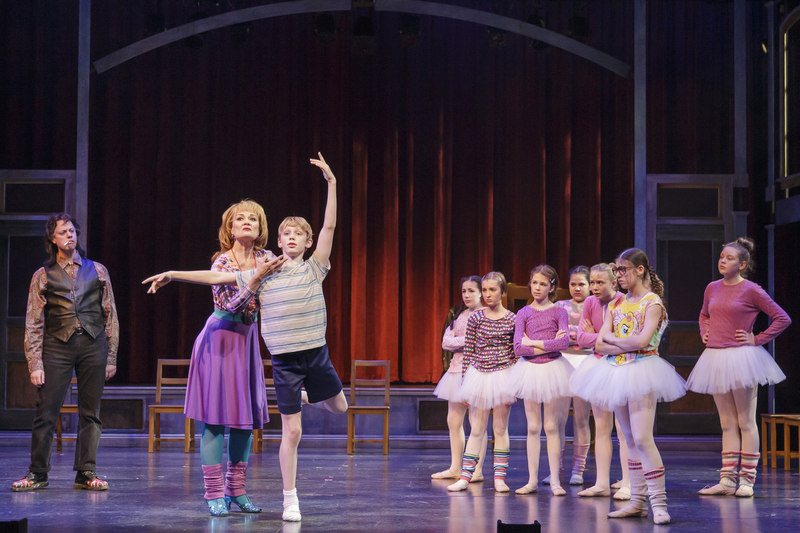 This is the case with Billy Elliot at Village Theatre, where by necessity, the role of a talented young dancer must be filled by a talented young dancer. Or in this case, four dancers, who play the titular role in rotation. I loved the movie Billy Elliot, about a boy in an English coal town who wants to become a ballet dancer. But I wasn't sure I'd love the musical. I often find musical theater’s witty lyrics and cheery choruses to be a poor fit for heavier subject matter. Heretic that I am, I’m not usually a fan of Elton John’s music, either. But the greatest strength of the musical Billy Elliot is how Elton John’s musical numbers maintain the emotional depth of the original movie, juxtaposing the ugly violence of Billy’s world with the beauty he discovers in dance. A tap dance that merely served to show the passage of time in the movie is transformed into the gut-wrenching “Angry Dance.” Katy Tabb’s powerful choreography captures Billy’s rage and frustration, while Billy’s primal screams fuse with the music in stark contrast to his sweet treble in other numbers. A funny bit of history explains how tap dancing became central to a story about ballet. The actor cast as Billy in the 2000 movie was primarily a tap dancer. Village Theatre’s four Billys all received months of tap training in preparation for their role, but unlike the original film-version Billy, each of them has studied ballet for years. After Billy (Philipp Mergener on the day I attended) had to act like a ballet beginner for most of Act One, it was a joy to see him dance his best in “Angry Dance” and in the beautiful Swan Lake ballet dream sequence where Billy dances a pas de deux with himself as an adult. Ballet or tap, Village Theatre’s Billy is a better dancer than movie Billy. Central as he is, Billy is not the only person on stage, or even the only child. Besides the four boys who play Billy, two boys received similar training for the role of Billy’s gay best friend Michael. Michael is a quietly tragic character in the movie, but in this production he is an irrepressible free spirit, played with scene-stealing charisma by Bryan Kinder on the day I attended. Philipp Mergener (Billy Elliot). Billy Elliot the Musical Production photo. © 2016 Mark Kitaoka. Property of Village Theatre. Billy Elliot doesn’t pass the Bechdel test, but the females who do take the stage make the most of it. Although only one of them has any lines, the half-dozen girls of the ballet school convey individual characters as dancers do, strictly through movement. Broadway veteran Mari Nelson as the prickly dance teacher Mrs. Wilkinson shines equally as a dancer and an actor. The role of Dad is understatedly demanding. In the wrong hands, he could easily become a blue-collar caricature, but Eric Polani Jensen brings humor, pathos and a versatile singing voice to the gruff role. The beauty of Billy Elliot is in resolving that solidarity and individualism are not conflicting values. Solidarity is what enables Billy’s individual success. Striking miners who are themselves on the soup line donate money to help Billy achieve a dream — a dream many of them don't even understand. If it’s hard to believe in such an optimistic vision of society, it’s still a vision I want my kids to imagine. Since I’m not one to watch my language around my kids, I was a little surprised when my 11-year-old leaned over during the performance and asked if it was really okay for her to watch this play. “There’s a lot of swearing,” she whispered. I think that what actually troubled her was not the language itself, but its casual and disrespectful use. Like the movie, the musical portrays the “rough manners” of a 20th century coal mining community, where parents and children tell each other to “piss off” and a coach has no qualms bopping a student on the head with a pair of boxing gloves. By contrast, modern theater-going families handle their children with kid gloves. As a result, most kids will enjoy the experience much more with some preparation. Talk to your child about the reasons these people may not be as considerate as we are teaching our kids to be, and point out the ways that their actions belie their words, demonstrating how much they really care about each other. • Village Theatre does not permit children under 4 years old in the main theater space; the Issaquah location has a soundproof family room if a sitter cannot be found. • Running time is two hours fifteen minutes plus a 15-minute intermission. • Read the production guide for a summary of potential issues to discuss with your child. Village Theatre productions are performed in two locations – Issaquah and Everett. Tickets can be purchased online. Issaquah: In Issaquah, tickets range from $40–$72. Buy online. Francis Gaudette Theatre, 303 Front St. N., Issaquah, WA 98027. Showtimes through July 3. Everett: Tickets range from $36–$68. Buy online. Everett Performing Arts Center, (425) 257-8600, 2710 Wetmore Avenue, Everett, WA 98201. Showtimes July 8–31.